I've watched Mean Girls about 1,001 times but never thought about dressing as one of the Plastics for Halloween....until now! Mean Girls is a cult classic. That goes without saying, even though I just said it. But how can you achieve an authentic costume? 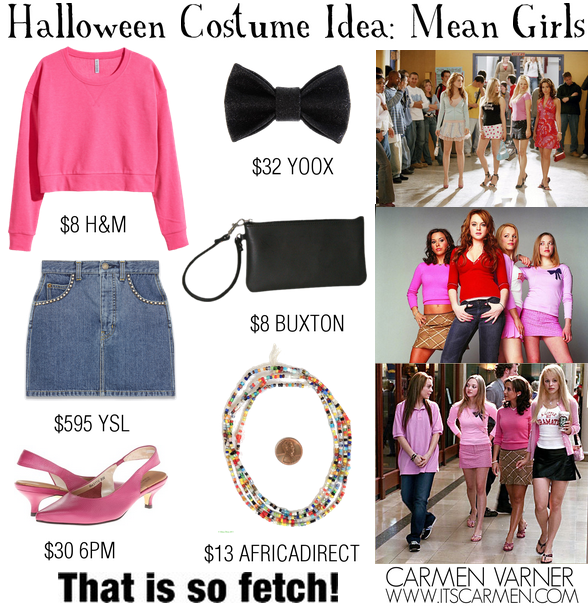 Well, I've got the basics covered for you with this fab Mean Girls & the Plastics inspired Halloween costume idea. In case you were wondering, the Plastics are a group of popular meanies consisting of Regina, Gretchen, Karen, & Cady from the film Mean Girls. You'll need a pink sweater. This cropped pink sweater ought to do the trick. After all "we wear pink on Wednesdays," remember? Don't forget to wear pink otherwise you can't sit with us. Why not pair your pink sweater with a denim skirt? They were extremely popular in the early 2000s along with sling back kitten heels which are worn throughout the film. Put all 3 together & you've got yourself a very 2000s look. Mean Girls came out in April 2004. To accessorize your Mean Girls Halloween costume, you can add a bow or brooch to your pink sweater as Karen wears in a couple of the stills from the film. I recommend a small strappy bag because that's what they wore back then. Not very practical, but hey it's fashion. Most of the purses throughout the film are simple in style, compact, & have just a little strap. In the movie, Cady wears a bracelet from Africa. I found this cool beaded bracelet set. Your costume ideas are too cute! I love the Clueless one too. Just caught it on tv the other night. This is such a great idea! I feel like people would have a lot of the clothing for this costume already, which makes it a more affordable costume option. Haven't we all watched Mean Girls a billion times? Great post, totally love the idea of rounding up your friends and going as The Plastics! We actually watched Mean Girls last night and were trying to think how we could come up with a costume! Thanks! OK, this is such a genius costume idea. Also perfect for someone that don't feel comfortable going all out! Very cute and genius costume idea!!! Thanks for sharing! Hope you are having a wonderful day! I AM having a wonderful day. Thank you. :] Hope you are as well. such a great idea! love it! mean girls is the funnest movie ever! Such a great idea for a post! On Wednesdays we wear pink. Great costume Ideas! I still don't know what to wear agh! Mean girls is such a good costume idea! Love all your picks for the outfit as well. I love your picks! Great ideas! This is such a cute idea and you'd be able to say all the classic lines all night! :) Hope you're having a great day! These are some great costume ideas! Mean girls is such a fun costume! So creative! Loving all your Halloween picks! :) Girly and fun! Me too. 9 more days!!! these are such great ideas, love it!